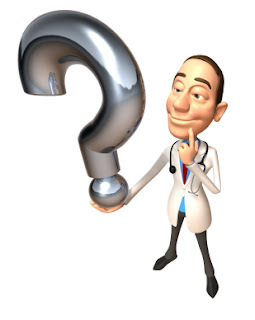 Dr.Malpani's Blog: The most important question your doctor can ask you ! The most important question your doctor can ask you ! One of the most useful questions to ask a patient is – What do you think is wrong with you ? The second most useful is – What did your earlier doctor tell you ? This gives me a lot of insight as to how well informed the patient is ; how much she understands about her problem; how realistic her expectations are of the medical treatment ; and insight into her emotional state of mind , as to what her fears and anxieties are. When the patient tells you what she thinks is wrong with her, it tells you more about how well she understands human anatomy and physiology ; and this is useful to know , because this becomes the starting point for your explanation . Good doctors start from where the patient is , and then educate the patient starting from that point . The patient’s description of that their earlier doctor told them tells you how much the patient understands from their earlier medical encounters. Often , when the patient says the doctor didn't tell me anything ( a very common answer ! ), it either means that the earlier doctor was not very good at communicating; or often that the patient is not a very good patient and did not bother to ask his doctor any questions or do her homework in order to verify her doctor’s advise. This is potentially a red flag , and means that this patient will require a lot more handholding as compared to patients who are willing to invest in information therapy. Sometimes patients don't understand why I ask these questions . They wonder why I want to know what their earlier doctor said ! They are worried that this means I may not know enough to draw my own conclusions. After all, they have come to be because they want an independent second opinion. They are worried that sharing the earlier doctor’s opinion may skew my opinion and cause me to be biased . This is not true. A good doctor will always factor in what someone else has said – and then make up his own mind. However, this is a useful starting point – why not take advantage of what the earlier doctor has done ? After all, there’s little point in repeating the same tests and treatments !